It’s very pretty this time of year. Lotsa blooming. Weather is perfect, not too hot. 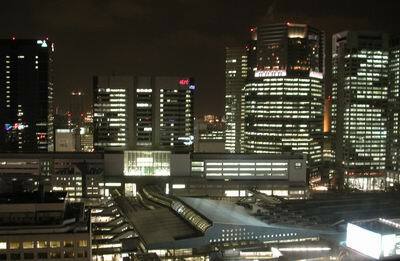 OK I’m not still in Japan, I’m on another biz trip stateside and having the typical insomnia. So you get more pics from my last trip. 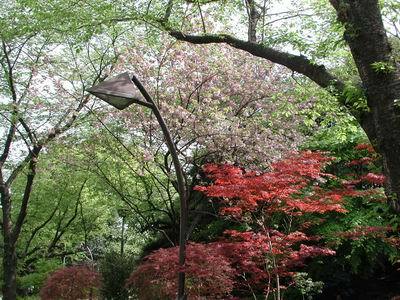 So I walked around Ueno park for a while on my departure day. OK, now for some knife content. I love going to Sushi bars. Why? Not because I like Sushi (I do… but there are better Japanese foods IMHO) but because you can sit on the counter, ignore the drunken Nihon-babble around you and stare at a master craftsman CUTTING STUFF. Lots of cuts, big chopping, nimble slicing, delicate flourishes. Its mesmerizing, especially after your fourth Oolong-Hai. I tend to go for lots of sashimi, not a big fan of the rice-bedded items. 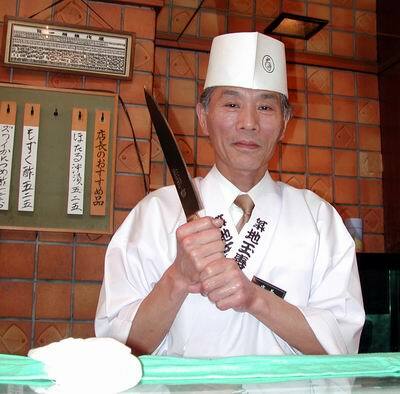 Anyway, this fine gentleman is Mr. Shigeyaki Shoda, General Manager of Tsukijitamasushi in Shinagawa. Highly recommended and not too expensive. 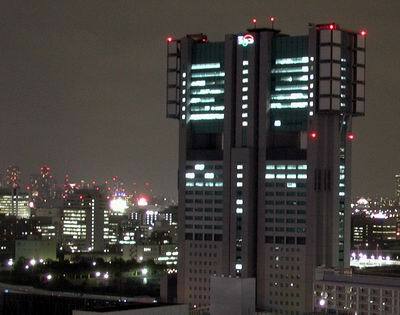 Tokyo. Home away from home. Typical high rise. Makes me think of William Gibson books. 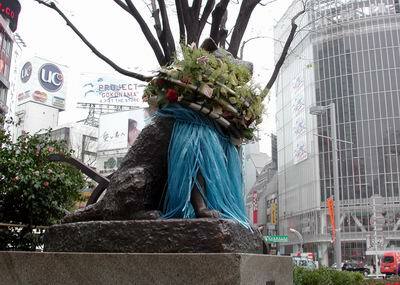 Hachiko was festooned with a creepy blue plastic grass skirt thing and wreath. I have no idea why. In all should be a good Easter, the eggs and candy are ready, ARC LS4+ on order, waiting for NewGraham to have Paramilitaries in stock. Going off to Japan next Monday. 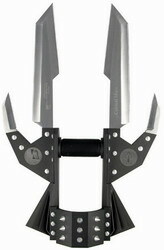 ObKnifeEntry: Calypso Jr used for opening toys, candy bags, cutting flowers, and preparing Halibut for dinner. Mmmmm. Macadamia nuts. OK, silliness will be on hiatus for this entry. Anyway this was a Christmas gift from last year, and the intent was that the lockless Pride could be a travel knife to such places with less freedom. The thing is, I havent been able to carry it much. My usual travel knife is the FRN Dragonfly, whose black plastic clip melds into my business attire undetectably. 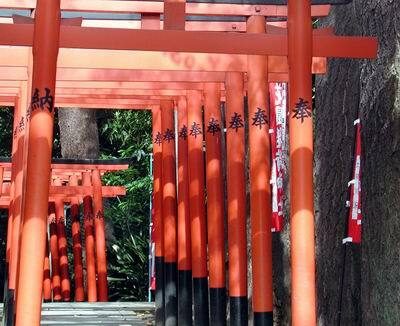 Fit and finish are classic Seki. I like the stylized clip on the pride, and the slip-joint tension is perfect, just enough to close one-handed but tight enough to saw on plastic or cardboard without fear. The 50/50 choil helps reduce accidental closure as well. Every time I see this one I think how silly it is that I cannot slip it into my pocket for my weekly business flights. Nevertheless it has replaced my old Case slipjoints for light-duty affairs. So: a proud addition to any collection. 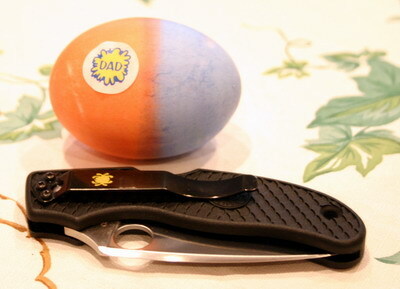 Well forgive my transgression from Spyderco here, but I think I have found the perfect EDC combo. Logically, if having a folding knife is nice, and a fixed blade is even more convenient, then this lil’ beauty is the best of all worlds. I find the longer blades good for larger cutting jobs, and their opposing edges make it easy to keep work material in a specified ‘cutting zone.’ The smaller blades (thumby and pinky as I likes to call ’em) are great for paring fruit, office chores, or general whittling. Driving and computer usage is a bit difficult, but I’m looking into a titanium keyboard. The blade is only 12′, but I have found out how truly useful a scythe-format can be for common chores! I carry it stuck in my belt, sash-style, with the blade bobbing openly in front of me ready for use. 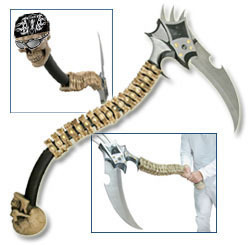 Sure, some of my office-mates give me ‘that look’ for carrying a somewhat tactical looking scythe, but what can you expect of sheeple? I have toned down the skull-pommel by adding Oakley sunglasses and a Raiders bandana. Yes, fantasy knives are a big business. No, I don’t really have any. Not my bag, baby. 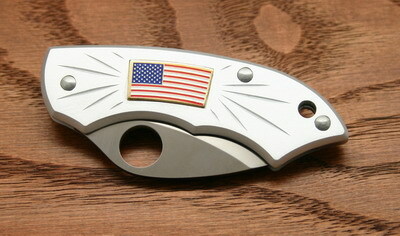 Yes, these are real, I saw them in Blade Magazine, and they’re made by a guy named Tom Anderson.